Monarch Air Group provides private air charter in Palermo, Italy. Our clients benefit from top-notch service, unrelenting dedication to safety, wide selection of aircraft, and years of experience in chartering private jets. To obtain a free quote, please use our online quoting tool provided below, or call toll free 1-877-281-3051. Monarch Air Group offers private jet charter services to and from Palermo (Italy). Located on the north coast of the island, Palermo is the capital and the largest city of the Italian island of Sicily. Situated right by the Gulf of Palermo in the Tyrrhenian Sea, Palermo possesses a large and important natural port, next to the Monte Pellegrino. Being one of the most popular destinations for luxury yacht charters, Palermo welcomes travelers from all over the world. 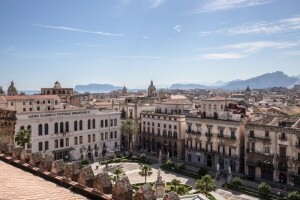 With a history of more than 2,700 years, Palermo has been noted for its rich history, unique culture, stunning architecture and great cuisine. The city has a rich mix of Arabic, Phoenician, Roman, Greek, Byzantine, Norman, and Sicilian traditions. The Quattro Canti is the beautiful historic attraction of Palermo, dedicated to Palermo’s patron saint. The most popular tourist attractions include the Basilica of San Francesco d’Assisi, the Cathedral of Santa Maria Assunta, the Chiesa della Martorana, and the Teatro Massimo. Palermo is the cosmo city on the island offering a plenty of beautiful beaches, picturesque landscapes, magnificent sailing, snorkeling, fine dining, shopping, and splendid architecture. The city is served by Palermo International Airport, which is located at Punta Raisi, 35 km west from Palermo’s city center.